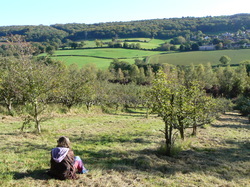 Orchardshare is a community group that manages three orchards near Bath, UK. It is run by volunteers. Any profits made are re-invested in our orchards. To create productive orchards and supply fruit to the local area. Promote wildlife at the orchards. Run community events at the orchards. Provide opportunities for people to enjoy and appreciate spending time at the orchards. Disseminate best practice developed at the sites. Broadlands Orchardshare was set up in October 2005, with the aim of putting a neglected commercial orchard back on its feet with community involvement. Broadlands orchard is on the Box Road in Bathford (aerial photo). There were over 1000 trees at the orchard, and initially the whole site was very overgrown and choked with creepers and brambles. Lots of people came along to monthly volunteering days and helped to prune the trees, clear the brambles and pick apples. A thriving community orchard was established, supplying locally grown apples and apple juice to the Bath area, and hosting regular community events. We made great improvements to the site. In 2010, we planted 40 new trees including plums, greengages, damsons, and quinces. We also improved the site for wildlife, with a pond and bomboretum (for bees), and put in lots of community facilities, such as a deadwood hedge and canopy for shelter, an earth oven, and compost toilets. The orchard share was based on a gentleman's agreement with the owner of Broadlands. He allowed access to the land for a small rent in exchange for the labour of the orchardsharers. In 2013 the owner decided to let the orchard to new proprietors, and the orchardshare group left the site at the end of the year. After leaving Broadlands, the core group considered the experience, equipment, and community support they had built up, and decided to look for a new orchard to manage. They found two: one in Wellow, the other at Dry Arch Growers in Bathampton. Infrastructure and access issues had to be worked out, overgrowth cleared, and new trees planted. The name of the group was changed to simply Orchardshare. The new orchards are now ready to thrive. Our latest venture is a beautifully sited orchard, in need of rejuvenation, at Northend (Batheaston). Our initial task is to harvest the apples and identify the varieties.